The goal this year must not only be to elect candidates to oppose Trump, but to also reform the Democratic Party (which is responsible for the situation in 2016 which enabled Trump to be elected president). Tuesday provides an opportunity for another progressive upset in Michigan, but it will be a challenge due to the presence of both a real progressive (Abdul El-Sayed) and a faux progressive (Shri Thanedar) who will divide the vote against establishment candidate Gretchen Whitmer. El-Sayed is running on a platform similar to that of Bernie Sanders. Sanders has endorsed El-Sayed, and came to Michigan to campaign for him on Sunday. The previous weekend, Alexandria Ocasio-Cortez, who was responsible for a major upset over the Democratic establishment, came to campaign for El-Sayed. He was also recently endorsed by The Nation and previously received endorsements from groups including Justice Democrats, Our Revolution, The People for Bernie, Our Revolution, the Progressive Caucus of the Michigan Democratic Party, and Democracy for America. El-Sayed is behind in the polls, but victory might be within reach. Progressives are encouraged by the greater enthusiasm seen for his campaign as compared to his opponents. Progressives are also encouraged by the memories of Bernie Sanders coming back from twenty-points behind just prior to the Michigan Democratic primary in 2016 to upset Hillary Clinton. The polls missed support for a progressive alternative to the Democratic establishment then, and could be doing so again. The front runner, Gretchen Whitmer, is the daughter of a former president and CEO of Blue Cross Blue Shield of Michigan, and the recipient of their money. She is also the only Democratic candidate who opposes single payer health care. She has also benefited from dark money contributions, which has become an issue in the race. When she twisted the facts to respond to El-Sayed, the Truth Squad at a Michigan newspaper called her claims “mostly inaccurate” as she tried to equate contributions from private individuals with her corporate contributions. The task of upsetting the establishment candidate is made more difficult by the presence of faux-progressive Shri Thanedar, who is running as a progressive for strategic reasons, and has put $10 million of his own money into the race. 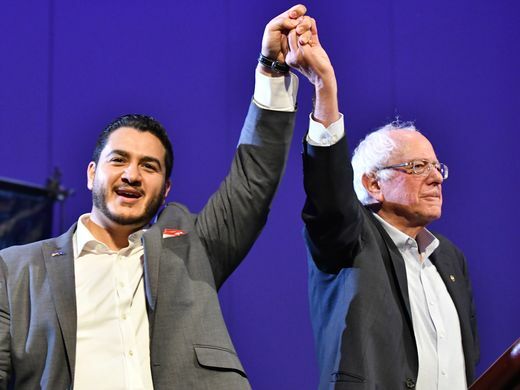 Hopefully the efforts of Bernie Sanders, Alexandria Ocasio-Cortez, and several progressive groups will lead to progressives coming out to vote for the true progressive candidate in the race, Abdul El-Sayed. Posted in Bernie Sanders, Democrats, Donald Trump, Health Care, Politics. Tags: Abdul El-Sayed, Alexandria Ocasio-Cortez, Bernie Sanders, Donald Trump, Gretchen Whitmer, Health Care Policy, Hillary Clinton, Justice Democrats, Michigan, Our Revolution. RSS feed for comments on this post.. TrackBack URL.